Peaches season is just going to end, so why don’t take all their sweetness and make something simple yet good??? During winter you can replace them with pears, plums, or even apples. 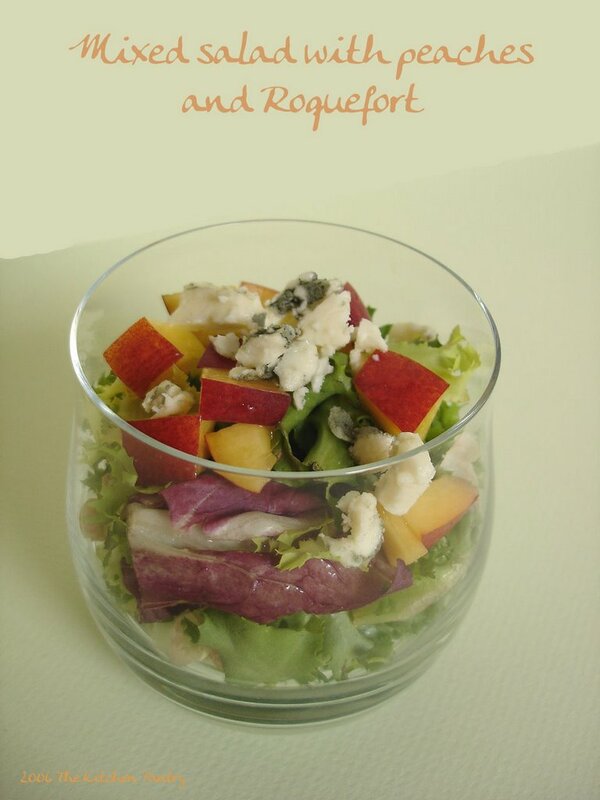 You can serve this salad in individual glasses (very hot in France at the moment) and it will enchant your guests! Place your mixed salad in the glasses or in a bowl, if you prefer. Wash the peaches, halve them, throw the stones, and cut the flesh in small cubes (if using nectarines you can leave the skin on). Drop a few cubes over the salad. Crumble the Roquefort and arrange it over the peaches. To make the vinaigrette, place all the ingredients in a jar, close it with its lid, and shake it until all the ingredients are combined. Drizzle it over the salads and serve immediately. Thank’s for this simply recipe!! Slurp! ;-) Beh….questa prima ricetta in English mi piace un sacco…fresca e saporita, ottima anche la vinaigrette!